Hey ya, hi ya. We are moving right along with our Teacher Book Talk Tuesday posts. 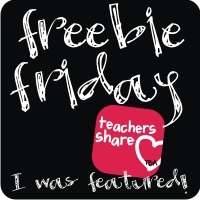 Today I have a couple nonfiction goodies to talk about, and a freebie, too. Each year we do a science unit on neighborhood animals. Although we talk about many different animals common to our area, we focus on squirrels. I mean, if there is one kind of animal we can count on seeing around school, it is squirrels. I don't have to go out of my way to give the kids authentic experience with squirrels, but I do. We take a walk in our nearby woods to see them and their nests. We take several walks in our woods but for the squirrel finding walk, I wait until the leaves have fallen because you can see nests so much easier. 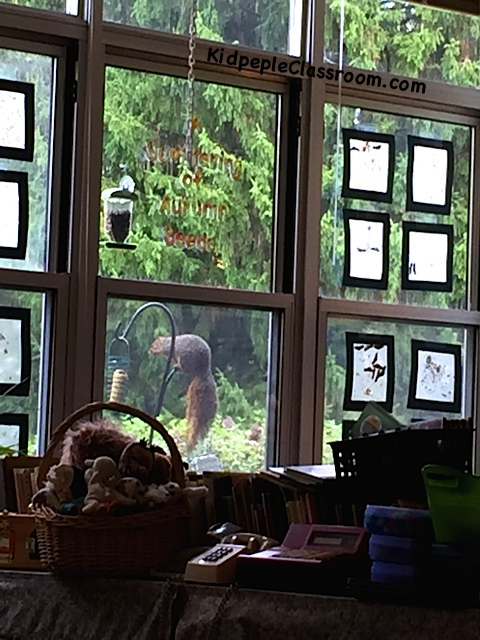 I put out bird feeders at the classroom window, which never fail to attract a squirrel or two. Usually people don't want squirrels eating from the birdfeeders, but the main reason I put any food out is to let my kiddos observe nature up close, any nature, and I am thrilled when the squirrels stop by. We all are. The first day this guy came calling I didn't think we were going to get anything on our schedule done– teachable moments are worth it. I have a love/hate relationship with squirrels– they are cute and funny to watch, but oh, how I hate when they pull up newly planted impatiens in my flower boxes. They've been doing it less since I starting sprinkling cayenne red pepper power about– you might try it if you have the same problem. One day on my way out of school I stumbled upon this guy and happened to have my phone in hand. He had found some student's uneaten sandwich and managed to get it out of the baggie. Cheeky little thing kept right on munching as I stood taking photos, which I later turned into this gif. That squirrel is eating some child's lunch! 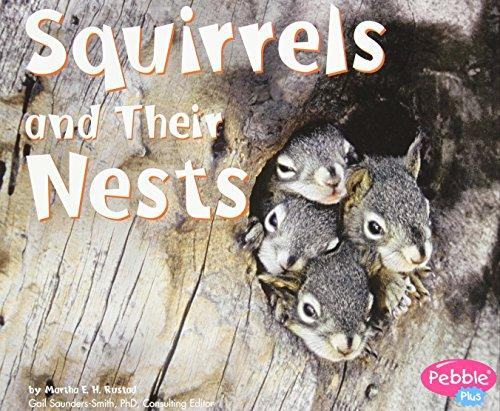 Anyway, by the time we start our animal unit in class my kidpeople are quite familiar with squirrels and it is time to focus on recall and new science learning. Squirrels and Their Nests is a great informational book. There are engaging photos. And just the right amount of text with picture support throughout. 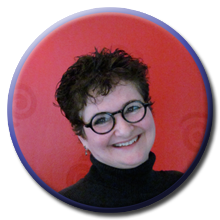 Martha E. Rustad is a very prolific writer. You can find one of her books on SO many different nonfiction topics. Here is a list of titles in the Pebble Plus series alone. If you don't have this on your shelf now, I recommend getting your hands on it. It could even already be in your school library just waiting for you. 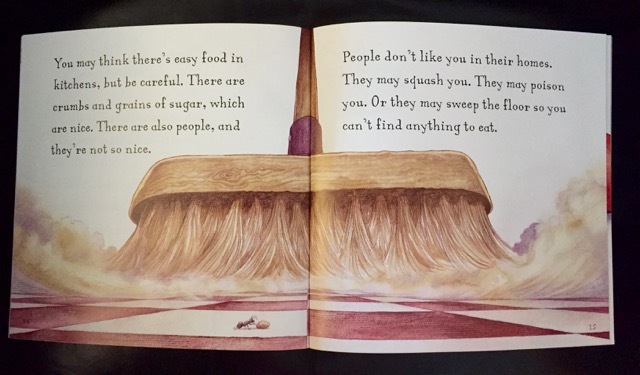 I like it so much I did an interactive read aloud with it for an observation. It was easy for me to find content and process goals to teach to. And I focused on the vocabulary word hollow. Our district went deeper into interactive read alouds and vocabulary instruction last year so this observation went really well. I found a great two minute video clip to go with it, and had my poor husband scrounging around in the wood pile for a hollow piece of lilac trunk that I knew was back there. The kids loved playing with it and some beanie baby squirrels afterward. All early childhood students benefit from rich and extended language activities. With a third of my class being beginning English Learners, it was a daily goal to build in as many opportunities to use academic language whenever I could, including play. 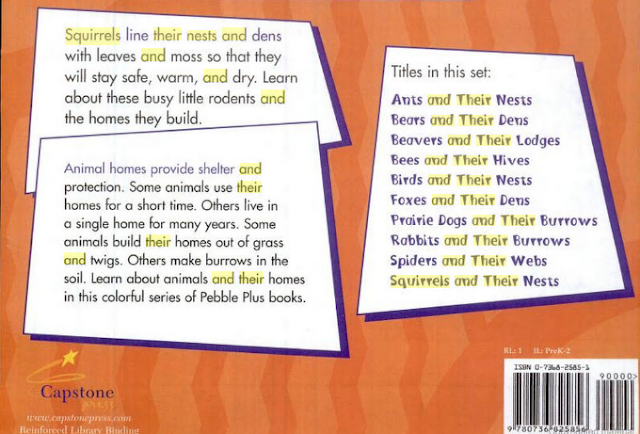 Quick tip: When doing an Interactive Read Aloud, put sticky notes on the outside back cover of the book. With just a fast glance they can help you remember the points you want to teach, and the language you want to use. Transfer them to the inside back cover when you reshelve the book so you have a quick refresher the next time you get the book out. 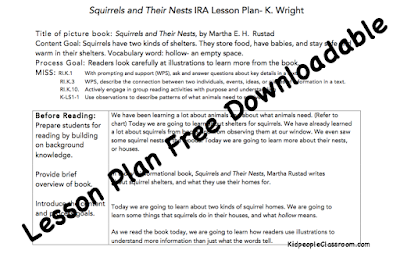 You may download the lesson plan I wrote if you like. Even if you don't use it exactly as is, it may prove useful to you. 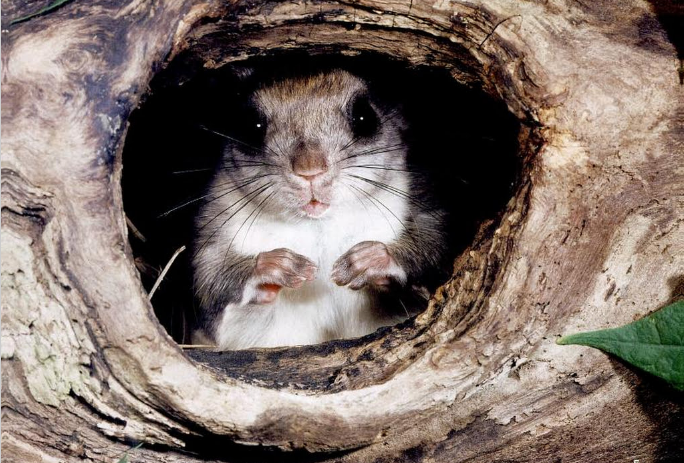 It includes the link to the BBC Squirrel video snippet, too. Click on the thumbnail to get it. Most years we do a mini-unit on at least one insect. 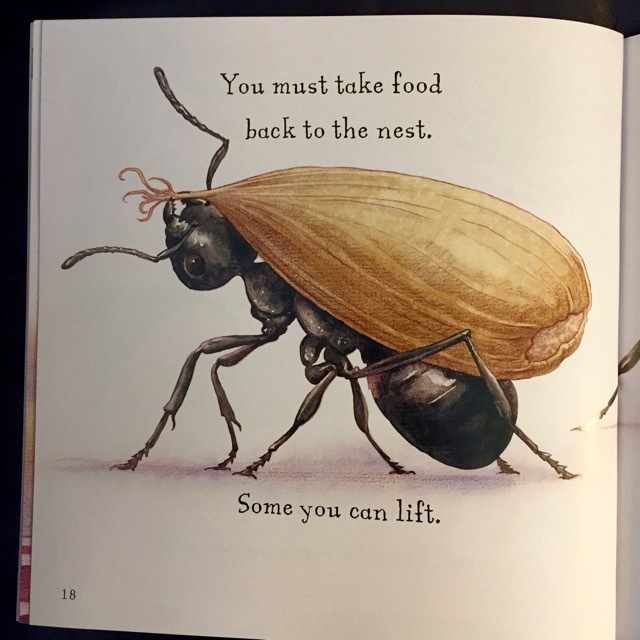 I found this book on ants and both I and the kids love it. 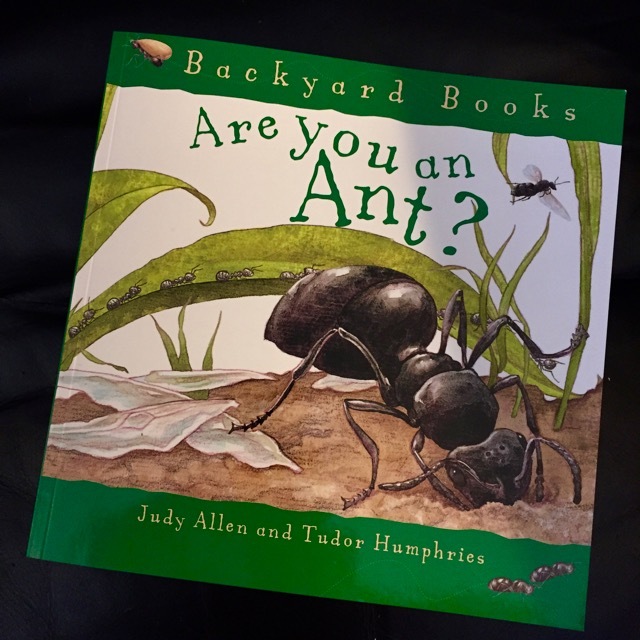 Even though this one reads like a story, written from the ant's perspective, mind you, it has lots of factual information about those fascinating little creatures. It also has beautifully rendered scientific illustrations. They speak for themselves. I like this book so much that I have another one from the Backyard Books series on spiders, too. There are many titles on common bugs– Lady Bug, Bee, Butterfly, Dragonfly, Grasshopper and Snail... is a snail a bug? Well, no, but you know what I mean. 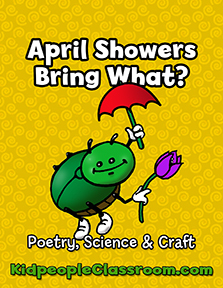 I would be remiss not to mention here that our bug mini-unit begins in April when the bugs just start to come out, and it kicks off with my April Showers June Bug informational poetry packet. 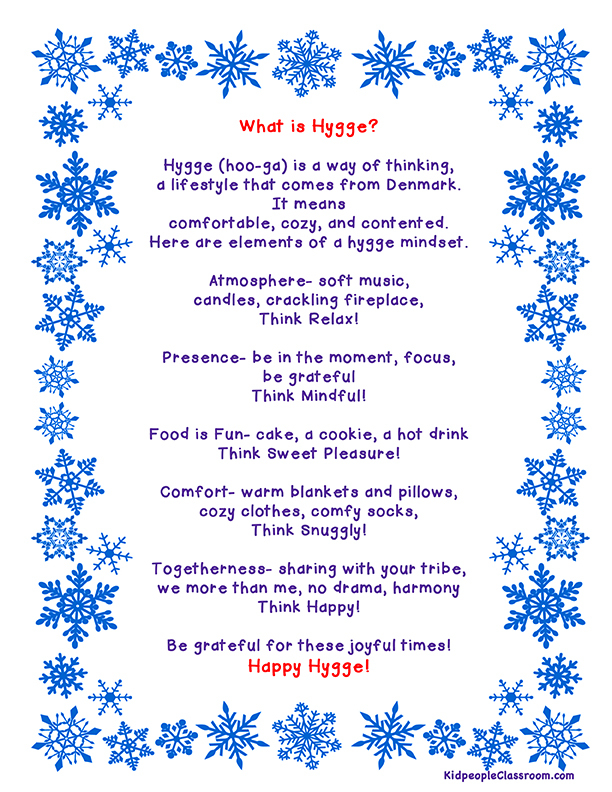 Yes, I combine science with a new twist on an old poem for some learning and fun. You can pick it up for a tiny price on my tiny TPT store. You will find all sorts of free stuff– I literally have more free than fee resources there, and I think you'll find it worthwhile to stop by. Click on the button to go. Whew. If you hung on through the post to this point, you get a little reward! There are only five more posts to the Teacher Book Talk Tuesday summer series. 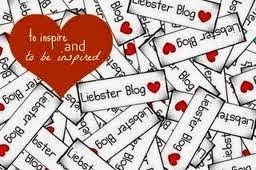 The last THREE posts, August 8, 15, and 22, will each have a book and Amazon gift card giveaway. Yep. 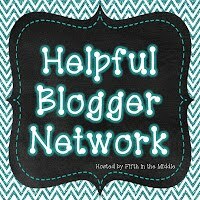 I'm going in with some of my faithful book review blogger friends to give away prizes. You'll get as many chances to win as ways you choose to follow us. In the giveaway posts I'll be highlighting three books from Flash Light Press– one of my FAVORITE children's publishers. Some of you might remember the book reviews I've already written for them and you can find them by clicking on Flash Light Press in the right sidebar searches. THANKS to Flashlight Press for donating the books to be given away! And teacher bloggers, here's special news for you. 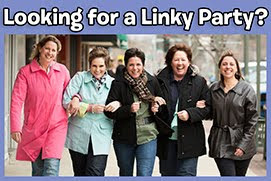 If you link-up to this Teacher Book Talk Tuesday linky THIS WEEK, you can get in on the giveaway, too. Wouldn't your readers like to win a book and an Amazon gift card? 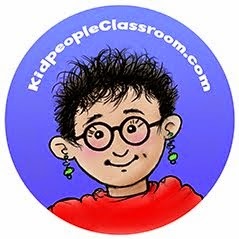 Just use the link-up link below, then grab the Teacher Book Talk button and put it on your post with a link back to this post. If you can't join us this week to get in on the giveaway, still consider linking a book review in the last three posts of the series as we are likely to have a few more readers. Thanks for stopping by. I hope the freebie and the book information you picked up today is helpful to you. 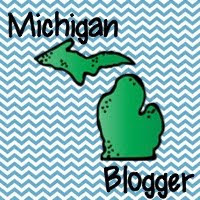 Be sure to check out the other book reviews from my fellow bloggers below.